The 90s Canadian Sanda Oh starrer, Last Night, was about the last night on earth, as an apocalyptic scenario (unexplained), descended on the world and played out in our hometown (Toronto). That one put a time limit on a question that has bugged everyone from the Stoics to Nietzsche and beyond, “how is life best lived?,” — especially when it’s about to come to an abrupt end. 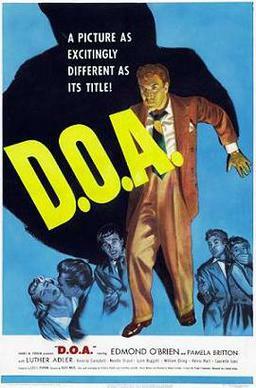 In D.O.A., the question is a simple one — it’s becoming your own detective as your last breath draws closer and closer. Frank Bigelow, an accountant, is on a business trip to San Francisco. While on the coast, he hits a bebop club, The Fisherman, featuring the most frenetic jazz band ever depicted in celluloid. There, his drink is swapped for another one, and gradually, Frank finds himself becoming increasingly ill.
Docs point out that he’s been poisoned, like he’s a Ukrainian politician. Lab tests reveal he’s ingested a substance for which there’s no antidote. Who would’ve/could’ve done such a thing? Frank has dwindling time to effectively solve his own murder, and it’s in the film’s stunning tracking shot opener that he saunters into a police precinct to make such a proclamation. From there, twists and turns aplenty, as Frank finds out there is a distant associate, Eugene, who’d been desperate to contact him before he died, apparently from a suicide. The trail then leads to Eugene’s window, and a mysterious bill of sale that Frank had notarized for the deceased, involving a suspicious substance. What keeps D.O.A. in motion is essentially an inversion of Kant’s categorical imperative: Frank has to treat people as a means to an end — he can’t behave otherwise as the clock is ticking away. As a result, what we get is a character removed from the conventions of how someone might ordinarily act. It’s unsettling, and realistic. D.O.A. fell into the public domain, but do yourself a favor and track down a high quality print. After all, it’s film noir, and you need the blacks as black as they can be (thanks, guys in Spinal Tap). Director Rudolph Maté cut his teeth working for Hitch (Foreign Correspondent) among others, and the Master’s influence is pretty apparent in the pupil. This entry was posted in Strange cinema and tagged 50s movies by Really Awful Movies. Bookmark the permalink.